The Eastern Wyoming College Veterinary Technology Club will be holding a dog wash on Friday, November 13th. Appointments will begin at 12:30 pm and walk-ins will be taken until 2:00 pm. The dog wash will conclude at 6:00 pm. A current rabies certificate is required to participate. EWC employees recently held a campus fundraiser for the Festival of Hope, raising $5,400. The Festival of Hope is a nonprofit organization whose mission is to help cancer patients who live in Western Nebraska and Eastern Wyoming with non-medical expenses as they relate to their cancer care and treatment. Employee groups at the College decorated bras and then displayed them for voting and donations. A total of $350 was raised on campus for the event which was held at Backaracks Sports Bar & Grill in Scottsbluff. The 14 decorated bras then were taken to the auction at Backaracks where they sold for a grand total of $5,050. One bra designed by Deb Eutsler, Food Services at EWC, was recognized as one of the top three and finished in 2nd place. This activity was organized by EWC employees Dixie Kroenlein and Vonda Soester. The winning bra on campus was created by the Welding department. Other department and individuals participating were the Business Office and Human Resources, Information Center, Copy Center, Academic Services, President’s Office and Institutional Development Office, Student Services, Karen Posten, Deb Eustler and Kroenlein and Soester. The Community Education office at Eastern Wyoming College in Torrington has announced a second session of Basic Self-Defense for Women. The College is encouraging past participants as well a new enrollees to refresh their skills and learn new skills. New techniques will be demonstrated and practiced including the use of pressure points. Class instructor will be Beth Reed, EWC Resource Officer and Torrington Police Department Officer. This class will be held on Thursday, November 5th at 6:30 – 8:30 pm, the cost of $20 and will be held at the Torrington Police Department at the Lincoln Center. WOMEN, LADIES, GIRLS: Take responsibility for preparing yourself in the event of a crime—the more prepared you are, the less likely you will have a need to defend yourself. This class is designed to increase your personal level of awareness, thus reducing the chance you will find yourself in a compromising situation, whether it be at home, in a parking lot, or out jogging. Basic self-defense techniques will be demonstrated with an opportunity for practice. Even if you’ve taken this class before, it is always to your benefit to refresh or practice your self-defense skills. To register for this class contact the Community Education office at EWC at 307.532.8213 or 307.532.8323. Because of a conflict with another entertainment event in Torrington, it is with heavy hearts the members of the Eastern Wyoming Arts Council announce the cancellation of the Goshen County Talent Showcase Gala event, scheduled for Saturday, November 14, 2015. The Gala was planned as a fundraiser for the Arts Council and would have featured stage performances by a selected number of talented local community members, a silent auction, refreshments for purchase, and a display of objets d’art by local visual artists. Funds raised were intended to offset the decrease in donations, season ticket sales, and grant funds available to the Council. The Eastern Wyoming Arts Council members send a heartfelt thank you to the community members who volunteered their talents and to those donating silent auction items. The Council has been bringing cultural and entertainment programs to the community for many years, but has found it increasingly difficult to find affordable programs that pique the interest of community members. The Council members thank all of the local community members and businesses who have supported their efforts in the past, and encourage them to support the remainder of the 2015/16 season: “V” The Gypsy Cowbelle, February 7; Chris Proctor, Acoustic Guitarist, March 6; and Flores de Colores Mexican Folkloric Dance Group, April 24. With grants, donations, and event attendance down so much, at the Council’s most recent meeting, members discussed disbanding the Council at the conclusion of the 2015-2016 season. A meeting to consider such a decision is scheduled for November 23, 2015 at 4:15pm at Eastern Wyoming College in Tebbet 132. As always public input is invited. 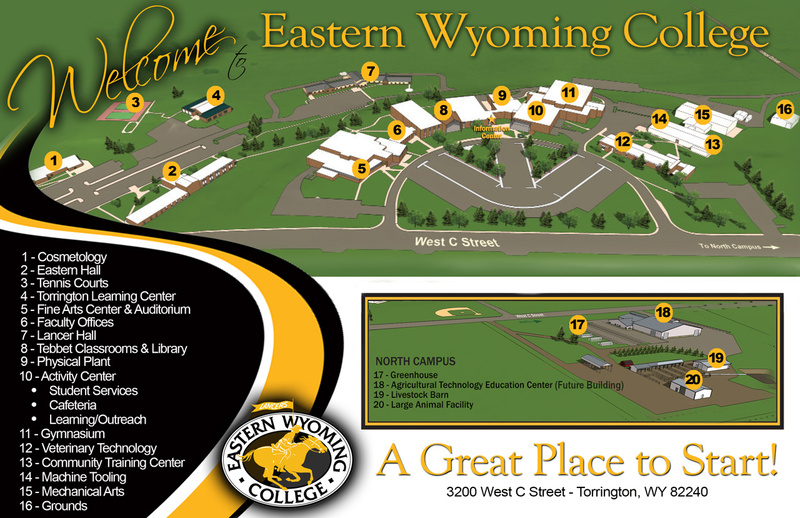 For information on the Eastern Wyoming Arts Council please contact Donna White at 307.532.8323 or by email at donna.white@ewc.wy.edu. The Eastern Wyoming College Veterinary Technology Club will be holding a fundraiser for the Panhandle Humane Society on Saturday, October 31, 2015 at Bomgaars in Torrington from 10:30 to 2 pm. Dog owners are invited to bring their dog in their best costume for a portrait. The cost will be $15 for a digital 8 x 10 edited portrait on a CD. Portraits will be placed into a drawing for three free pet washes at the Vet Tech Club dog washes and a bag of treats of your choice. Winner to be notified by either email or phone. For more information, please contact Cristi Semmler, vet tech instructor at 307.532.8331 or by email at cristi.semmler@ewc.wy.edu. The Community Education at Eastern Wyoming College in Torrington is offering the following classes kids and their parents. Instructor Vivian Lulow will have a special artistic all occasion card making class. All the colorful, varied materials and equipment will be provided. This is a great way to spend an afternoon with your parents or children. Children must be in grades 2-5 and accompanied by an adult. This class will be held on Saturday October 24th from 1-3:00 pm and will cost $30. Bev Patterson will be the instructor for this class that will be held on October 26 & 27 from 6-8:00 pm in room 117 at Torrington High School. The cost is $25 and all supplies are provided. Cookies will be baked on Monday and the ice-cream will be added on Tuesday. Please bring a freezer safe lidded container to take your treats home. Your pet deserves the best in pet care and it takes everyone on the veterinary health care team to make that happen. The National Association of Veterinary Technicians in America (NAVTA) recognized that fact and created National Veterinary Technician Week (NAVTW). As a member of the veterinary healthcare team, Veterinary Technicians are educated in the latest medical advances and skilled at working alongside veterinarians to give pets the best medical care possible. They work closely with the veterinarians, veterinary assistants, practice managers, and owners to provide essential care to all species of animals; pets with fur, feathers, scales or skin. NAVTA has proclaimed October 11-17, 2015 to be National Veterinary Technician Week. This annual event recognizes veterinary technicians for their contributions in pet healthcare, as well as veterinarians, assistants, practice managers and others involved in pet care. This year, Hill’s Pet Nutrition, a company dedicated to helping pets reach their full potential through quality nutrition and healthcare, is sponsoring the week-long celebration. NAVTA is a nonprofit organization that represents and promotes the veterinary technician profession. NAVTA provides direction, education, support and coordination for its members. Incorporated in 1981, NAVTA is the national organization devoted exclusively to developing and enhancing the profession of veterinary technology. Pets give us unconditional love and veterinary technicians provide TLC to pets and animals. Celebrate National Veterinary Technician Week by recognizing the team members providing veterinary care to all species of pets. More information about NAVTA and this special week can be found at www.navta.net. The Eastern Wyoming College music department has announced the Faculty and Friends Recital on Sunday, October 18th at 3 pm in the EWC Fine Arts Auditorium in Torrington. This recital is free and open to the public. The fall concert will be held on October 25th at 3 pm in the Fine Arts Auditorium in Torrington and will feature the EWC Collegiate Chorale, EWC Community Choir, EWC College/Community Band and EWC Jazz Combo. This fall concert will be conducted by EWC music instructor Michael DeMers accompanied by Janet Howard and is free and open to the public.